In Windows 8.1, the currently active task on the taskbar looks almost the same as the inactive ones. It would be nice to be able to fix it with Classic Shell. @Guarav This thread could actually be interpreted as a duplicate of a thread I made a while ago about Taskbar buttons, but nobody in their right mind would draw that association since one thread is about making things prettier, while the other is about making them easier to use, not to mention how the two requests could result in different feature implementations if anything was done on Classic Shell's end .-. Gaurav, thanks for the link. Reading this helped me to find out why themes didn't work for me: as a staunch supporter of the classic shell, I had Themes service disabled home domain-wide. Now they work. But there's a big trouble with all classic themes: they change the look of the most of Internet sites in my Firefox. Of this forum, too - its background becomes all white if I choose a classic theme. BTW your theme ("Windows 8.1 [Dark Active Button]") doesn't actually changes anything for me - I mean in comparison to the default Windows theme with those "Egypt pyramids". No dark button. Splitwirez, I'd like to try these buttons, so please download them somewhere. You have to install a UxTheme patch or UxStyle for it to actually apply the Visual Style...did you do that? .-. Gaurav, BTW your theme ("Windows 8.1 [Dark Active Button]") doesn't actually changes anything for me - I mean in comparison to the default Windows theme with those "Egypt pyramids". No dark button. Applying a theme isn't easy if you are not experienced with applying them as not only do you have to install UxStyle but also there are bugs when applying the theme sometimes unless UxStyle's Unsigned themes service is restarted. It is mentioned in the linked article. ...the style I linked to doesn't require UxStyle - it's signed by Microsoft. Gaurav, I have tried both UltraUXThemePatcher and UxStyle. And yes, I restarted Unsigned themes service. I believe this is by design 'cause all these themes are high contrast variations. Very bad. Splitwirez, I tried your theme but unfortunately it doesn't do what I need, too. I want a simple thing: solid color desktop, the visually different active task button on the taskbar and left-aligned window titles. Along with not touched look of other applications. Is it too much for Win8? Unbelievable. That screenshot indicates that the style was installed incorrectly. That's not the Dark Button style, that's just Aerolite. Well that's been provided, but it looks like you've installed it incorrectly. You have to copy the "aero7" and "aero8" folders to "C:\WINDOWS\Resources\Themes". A custom Visual Style can do that for SOME, but not ALL applications. This feature is provided by a project which aims to resurrect the Classic theme. More on that here (though be warned, it's pretty broken right now...usable, but not fully functional). That's entirely possible, it's the High-Contrast feature which was interfering with Firefox while the Classic Styles were active. That's what I said. Applying the theme is tricky unless you are an experienced user. If you follow the exact steps and make no mistakes when copying files to the correct directories, it should work. The fresh screenshots attached here are proof that they work. Your screenshots show that for some reason the theme is not getting applied properly. It may either because you didn't follow the correct steps or maybe you copied the files incorrectly. I recommend you use only one theme patcher at a time. UxStyle IMO is better because it does in-memory patching and has been rock solid always. You should revert all changes made by UltraUXThemePatcher and do not use it/uninstall it. It may also be the case that UxStyle isn't working because the files are patched versions by UltraUXThemePatcher. Here is my DEFAULT Windows 8.1 theme but with darker button for active window. In the link I posted above, there is also a theme for Windows 8.1 with Windows 7 appearance/visual style and darker taskbar button for active window. Of course, it will require the Themes service to be running as well as the Unsigned Themes service. It is NOT a classic theme, it does not have any classic theme elements. These are regular Windows 7/8.1 themes with darker active taskbar button. Extremely rare. I got them via 'PainteR', a friend of a friend for no cost! He's a pro at theme design and hacking/patching and was extremely kind to have spent his time creating these themes for me. I am a complete n00b at theme making and never ventured into modifying themes unless it affected usability in a really bad way. I am familiar with Vista/Windows Style Builder and know what needs to be done but it's a lot of work modifying any theme properly. 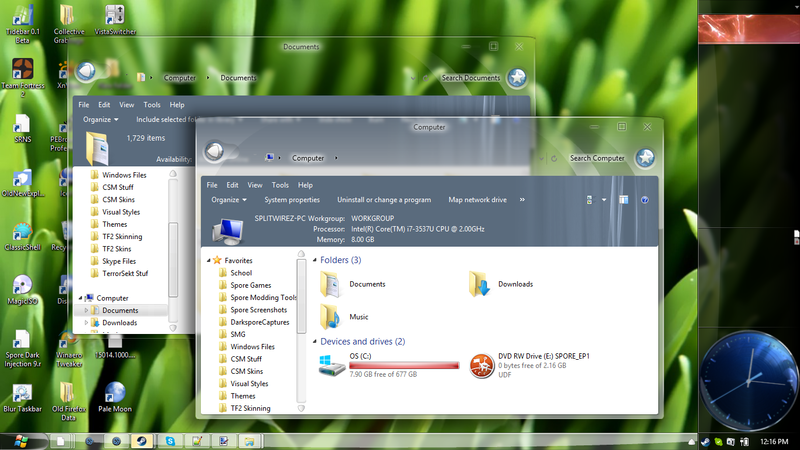 Also there is a theme in the same ZIP for Windows 7 with a darker button for active window. Windows 10 can go die in hell. There is only a Windows 7 theme for Windows 7 that I have with a darker active window and left aligned titles, as this screenshot shows. Also note that themes/visual styles are very OS specific. A theme for Windows 8.1 won't correctly apply to Windows 8 and vice versa. Even the subsequent updates that Windows 8.1 got (Update 1, Update 2 and Update 3) caused themes to break so you'll need a theme specific to the last FIXABLE version of Windows, which is 8.1 Update 3 (November 2014 Update Rollup) before you can correctly apply these themes. Thank you guys, I got it now. My mistake was to copy theme files to %LocalAppData%\Microsoft\Windows\Themes instead of %windir%\Resources\Themes. I couldn't imagine that it can make a difference. In Windows 7, there's no need in additional themes at all 'cause Classic one is available there . Unfortunately it turns off the DWM making the experience jerky and far from smooth. That is why I gave up the classic theme starting with Windows 7. Classic theme should have been updated for Windows 8. Well when a file specifies the path "C:\WINDOWS\Resources\Themes", what reason would there be to assume you'd magically be able to put it in "%localappdata\Microsoft\Windows\Themes" and get the same result? .-. It's one thing for it to be tricky and difficult to do, it's another thing entirely for the user to be given instructions and blatantly disregard them. ...if I ever said I wouldn't take a request of the sort, it was because I'd have thought you wanted me to build an entire style for you, not because I would't have made a small change like this. The only reason nobody is using the Classic Theme is because Microsoft lied to us and said they removed it ._. Unfortunately it turns off the DWM making the experience jerky and far from smooth. Can you please give an example of this? I have a little Win7 experience 'cause I was on WinXP all the time, and I never noticed any troubles using the Classic theme on Win7. I've supposed it's like a common ability to make changes either system-wide or user-wide. Is it possible to get this normal look on Win8? I think Guarav, like myself, just prefers having DWM on. I'd imagine that if that's true for themes, it's only because they all use a Visual Style that's already present on your system (Aero). Guarav and I both recommended alternative Visual Styles, which need to be installed to the path specified in the accompanying theme file. I gave you that path, but it never occurred to me to specify that you can't use an alternative method that I didn't even know existed .-. The taskbar doesn't look classic to me? Even if I might be able to skin some part of it with Classic Shell, the active buttons don't look right on Windows 10. I will try running that EXE you linked on Windows 8.1 Update 3 (Nov.2014 rollup). I had seen your post some time ago but it had scary warnings, wasn't UAC compatible and I didn't realize you were THAT Splitwirez. Update: I tried it but it has too many deal-breakers so no, Splitwirez your theme is not an acceptable solution. Oh right! It just never occurred to me. Can you please make this teensy modification then? 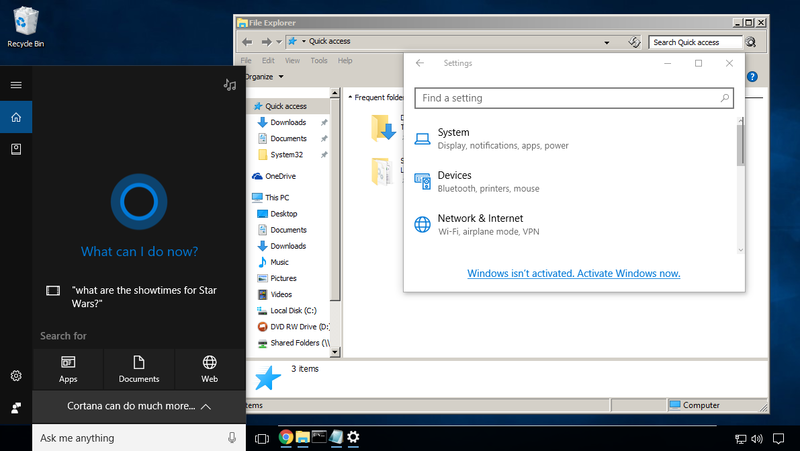 Take the 'Windows 7 appearance for Windows 8.1 with darker active window button' theme and left align the title bar text. Btw, my name is Gaurav, not Guarav. Guarav sounds like Guava. The taskbar doesn't look classic to me? Even if I might be able to skin some part of it with Classic Shell, the active buttons don't look right on Windows 10. Yeah Windows 10's Taskbar is just hardcoded to hell and back. Now you know why I was wimpering pathetically about Taskbar Skinning from Classic Shell a while ago .-. I will try running that EXE you linked on Windows 8.1 Update 3 (Nov.2014 rollup). I had seen your post some time ago but it had scary warnings, wasn't UAC compatible and I didn't realize you were THAT Splitwirez. I really need to rewrite that OP...older versions of the application weren't UAC compatible, but the current one is. This is why copypasta is a bad idea .-. I'll see what I can do. Titlebar text alignment is one thing that's always baffled me...not sure if it's just me though, or if it's actually hardcoded to the center .-. Above in this topic? I don't see any link from you except to Aero RP. Please give that magic link again. I really want this classic window title style. Minimize/maximize animations - it's about window animation? I don't see any significant change of its speed when changing from Classic theme to Windows 7 Basic theme in my Win7 VMware virtual machine. I'd even say, with Classic theme it's faster. VistaSwitcher works with both themes in the same way. I read your link. It is said there that 2D performance in Win7 is sometimes slower than in Vista and WinXP, but it is not said there that it can be fixed by not using the Classic theme. a project which aims to resurrect the Classic theme. More on that here (though be warned, it's pretty broken right now...usable, but not fully functional). it's about window animation? I don't see any significant change of its speed when changing from Classic theme to Windows 7 Basic theme in my Win7 VMware virtual machine. I'd even say, with Classic theme it's faster. You should read about Desktop Window Manager (https://en.wikipedia.org/wiki/Desktop_Window_Manager) and how compositing works. Windows Basic theme that ships by default in Windows 7/Vista does not have DWM enabled either. Basic theme does not enable DirectX Video Acceleration either so you'll get tearing in videos and when rendering a lot of 2D stuff. Thanks for the link. Now it had got clearer to me. And you're right, VistaSwitcher is definitely NOT working the same way with the Classic theme. What do you think of this: DWM Theme which emulates the old ClassicTheme? BTW why do you guys so hate Win10? Just wondering. For me, after WinXP, Win8.1 looks absolutely ugly. Is Win10 really a next step to the hell? What's not good with Windows 8.1 [Dark Active Button] theme is white window titles. Very inconvenient if there's a window in a window (RDC for example). I have missed a couple of times already. Defeats the purpose IMO...you don't get the performance gain with that thing ._. Why does it change THAT...? .-. For me, Windows 8.1's window frames and appearance are more usable than the overuse of transparencies with Aero on Vista/7. That said, the flat colors do look ugly. Luckily, Windows 8.1 can be skinned and it will remain as you want! You can now skin the taskbar too thanks to Classic Shell besides window frames. Windows 10 on the other hand does backstabbing changes via updates. It's over really. Windows 10 is the Devil. I can't even begin to state what's wrong with it. Btw I don't get white titles with that theme on 8.1. Again something on your PC that's making it not apply the theme correctly. I get black titles. There is nothing different from the default 8.1 theme except the taskbar active window button appearance. This is my 8.1 theme. Yes, the title bar's flat color is a little bit ugly but hey it's usable at least. It tells me which is the active window **easily**. And if you don't like it, you can skin it to make it like Windows 7! For me, Windows 8.1' window frames and appearance are more usable than the overuse of transparencies with Aero on Vista/7. That said, the flat colors do look ugly. Luckily, Windows 8.1 can be skinned and it will remain as you want! You can now skin the taskbar too thanks to Classic Shell besides window frames. Actually Windows 8.1's Taskbar is natively skinnable - the requests I put in were targeted towards 10 ._. Windows 10 on the other hand does backstabbing changes via updates. It's over really. Windows 10 is the Devil. I can't even begin to state what's wrong with it. There is nothing different from the default 8.1 theme except the taskbar active window button appearance. This is my 8.1 theme. Yes, the title bar's flat color is a little bit ugly but hey it's usable at least. It tells me which is the active window **easily**. ...is this enough active/inactive contrast for you? And if you don't like it, you can skin it to make it like Windows 7! Why does it change THAT...? It's my fault again: I changed the desktop to the solid color and forgot to change "Color" from Automatic to something else. I should note that M$ did everything to make the process of selecting even harder, again. "Hue", "saturation", "brightness" - what the hell is it for? Why not simply RGB values? I want the color of Classic theme's window title but have no chance to get it. I'm staying with pre-defined dark gray color. And sounds. Why including sounds settings to the desktop theme? Every time I experiment with themes I need to change sounds back to "No sounds". Arggh. Maybe but all a simple user can customize is the desktop background and window title/border color. Just wondering: what are the tools to create Windows skins? "Hue", "saturation", "brightness" - what the hell is it for? Why not simply RGB values? I want the color of Classic theme's window title but have no chance to get it. I'm staying with pre-defined dark gray color. And sounds. Why including sounds settings to the desktop theme? Every time I experiment with themes I need to change sounds back to "No sounds". Arggh. What I meant was that the Visual Style engine is at its most powerful in 8.1, not that it's at its most accessible. It has never been open to users and most likely never will be. 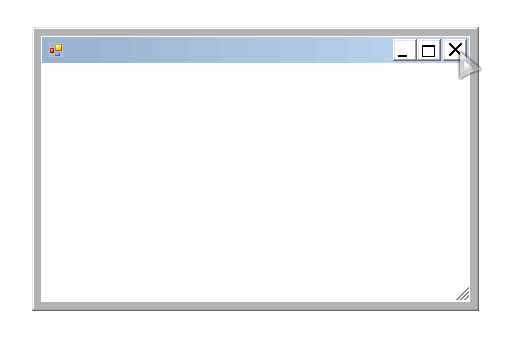 Uh, MsStyler exists too if you don't want to pay for something, but it's...kinda barebones...like, really. Use Windows Style Builder. It's better. WAAAAAY better. Splitwirez, your ClassicTheme.exe seems to work properly under Win81x64, except one thing: the taskbar becomes white, and the font color is white, too. I didn't find a way to change it. 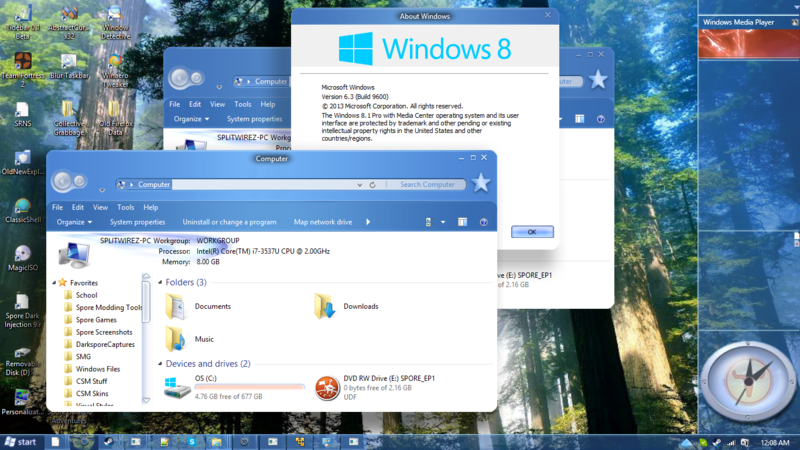 The same is under Win81x86. 2. Use a black or extremely dark wallpaper...atleast, the part of the wallpaper behind the taskbar has to be black. The rest can be whatever you want. but still want to change the color of the taskbar to gray. What is buggy here as you mentioned earlier? Last edited by GCRaistlin on Wed Feb 08, 2017 1:28 pm, edited 1 time in total. Can't a similar hack be applied to Win7 to get the classic theme with DVM enabled? You should really turn Blur off too. And uh, the included deskn.cpl tool can set the colours. Overall though, it's surprisingly usable. A pleasant surprise, IMO. Assuming you mean DWM, the answer is, surprisingly...no. The trick is new to Windows 8+ .-. According to the readme it is off by default. Yes now it works. Except menu color - it remains white whatever I choose. Oops, again a temporarily issue. Does it mean that it is unable to connect to Wi-Fi? I don't have a wi-fi adapter on my PC so I can't check. Last edited by GCRaistlin on Wed Feb 08, 2017 1:18 pm, edited 1 time in total. - standard Task Manager doesn't work. But Sysinternals' Process Explorer is better anyway. with triggers "At log on of any user" (+ "Delay task for 3 sec") and "On local connection to any user session". Copy the file ClassicTheme.exe to C:\Windows and run it to install. Actually, it may be installed from any directory. ...right. Sorry, not used to not having a Glass Taskbar ._. Nonononono, you can still connect, you just lose the interface. ...I usually just manually re-run it .-. Interface to what? Will I be able to connect to a new wi-fi network - choose a SSID from the list and enter a Wi-Fi key? As stated above, you can only do so on the login screen ._. It may be a bit difficult to copy Wi-Fi key from KeePass on the login screen. But we are able to temporarily uninstall your program, login to another user, connect to a new Wi-Fi network, log off, reconnect to the our user session and install your program again. The only issue is that we need admin rights for this. Can you please add support for a command line parameter like "/silent" to make it possible to install/uninstall your program by launching a task in Task Scheduler? ... is a dumb way 'cause 3 sec may be too many or too little. echo SetWindowCompositionAttribute.exe not found (must be in the same directory^). echo ClassicTheme service is not running. This doesn't work. Anyway, a command line parameter is better: GUI is surely needed for the first time installation. ...well that's how it works but okay, if you say so. In any case, I didn't write the application, and I don't have the skills to add a command line parameter. What I do know is that technically there's no need for a UI at all. I thought it's yours. Does renaming really work for you? ...then again, there are other methods of enabling the Classic Theme alongside DWM on Windows 8+, listed on the WinClassic forum. Maybe one of those would work better for your needs? The instructions say so too. But there's no instructions in w8classic.zip? I'm OK with this method, I would just like to make it a little better. HOLD ON...I think I just figured out what the problem is! The ClassicThemeA.exe trick only lasts until you log off, and only affects processes created after it is run. Could it be that you tried it, saw nothing immediately visible happen, and concluded it didn't work from that? I rename ClassicThemeA.exe, run it, get a prompt to install, press Yes. Then I run it again, get a prompt to uninstall, press No. Then I gog off and log on, run it again, get a prompt to uninstall. The behaviour is the same as if I didn't rename it. But...you already have it installed by that point. You're not supposed to install it at all, it's the "Enable Classic Theme Now" feature you want... ._.